PRICE PROMISE - WE WON'T BE BEATEN ON PRICE! Click the button below to add the KTM Oil Filler Cap and clutch/gearbox breather to your wish list. May fit other bikes fitted with an M24 x 3 oil fiiler cap. 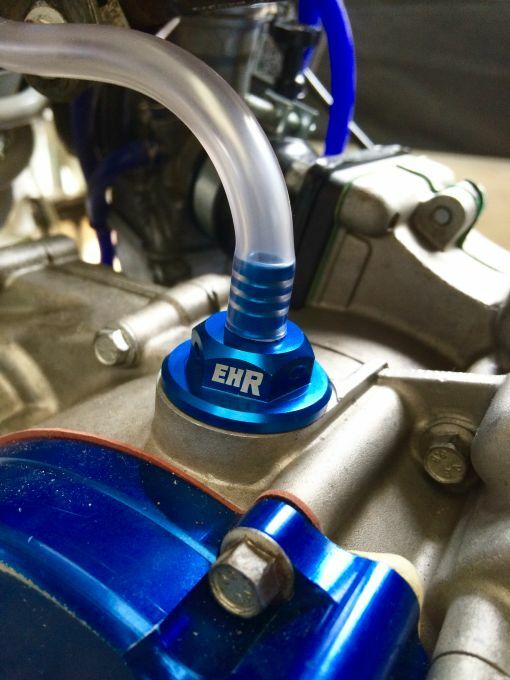 The Judd Racing Oil Filler Cap and clutch/gearbox breaher will help to dissipate any excess air pressure caused by heat build up in heavy use or race conditions. A "must have" for any tuned race engine! Please note any orders sent via a Courier will require a Signature. We always request a signature is obtained from the recipient . SHIPPING to Russian Federation from GBP 35, Delivery within 10-28 Days direct to the consumer. Please be aware we are in the hands of the Russian customs officials on how quickly these parcels arrive. We are dedicated to our Customer Service and ensuring that you are completely satisfied every time that you shop with us online or via the phone, and this includes our delivery service. Most products detailed online are kept in stock, ready for dispatch. If an order is placed for a stock item before midday, your order will be dispatched the same afternoon. For U.K. deliveries small postal items, are sent via Royal Mail. Often, the item will be delivered within 2-3 working days, although this does depend on the Post Offices seasonal workload. All orders are dispatched Monday to Friday and all deliveries are made Monday to Friday 8am to 6pm. Unfortunately, we are unable to advise on actual delivery times via Royal Mail, but you will be given a tracking number for DPD who normally guarantee the delivery time. We will not be liable for additional postage costs due to re-deliveries. Please allow seven working days for domestic deliveries and fourteen working days for international deliveries before reporting a non-delivery. Please allow up to 28 Days for deliveries to the Russian Federation, as parcels can be held up by customs. To calculate the shipping cost of your order, please place all items you wish to purchase into the shopping cart and proceed to the checkout. Before you are asked for your payment information, you will be advised of the shipping cost. Free delivery is calculated automatically on all applicable orders. For countries not listed, please contact us for shipping costs. Free shipping is applicable on telephone and internet orders over GBP 100 to England, areas of Scotland and Wales only. Unfortunately, our free shipping offer does not apply to Republic of Ireland or any offshore locations. Please be assured that our shipping costs are kept as low as possible to these locations. We are constantly trying to improve our service and reduce the costs to our clients.